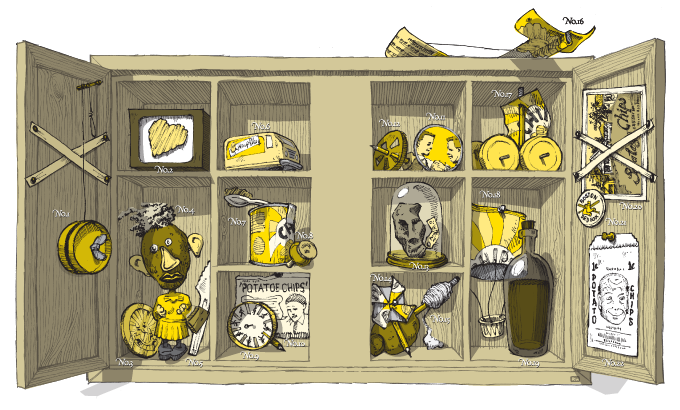 The twenty-two objects on display in this Cabinet of Potato Chip Wonders represent only part of the holdings of the Museum of Potato Chip Science. No.12 Helicopter – Wooden spool transmission, pencil mast, and chip lid rotor blades § No.13 Shrunken Head – Desiccated potato treated with natron (an embalming salt) § No.14 Pinwheel – Chip-bag blades, map pin spindle, and pencil shaft § No.15 Potato Mill – Spinning toy employing a stick, a string, a chestnut, and a potato § No.16 Glider – Chip-bag fuselage and birdlike dihedral wings reinforced with glue and sewing-thread guy wires § No.17 Sail Car – Chip tube lid wheels and foil bag sail § No.18 Parachute – Ketchup cup, single-serve chip bag, and thread § No.19 Indicator Juice –Red cabbage solution used to test the relative acidity of solids § No.20 Saratoga Springs, N.Y. postcard – Generally recognized as the birthplace, in 1853, of potato chips § No.21 Pin – 1965 Guy’s Potato Chips pin, Boston Red Sox § No.22 Potato Chip Bag – Glassine chip bag bearing frowning (or smiling) man, circa 1940. Copyright 2009, A. Kurzweil & Son. All rights reserved.